Friday, June 23 9 p.m. to close: no train service to three stations — Hawthorne/Lennox, Aviation/LAX and Mariposa. Saturday, June 24 open to close: full closure of tracks west of Crenshaw Station. Sunday, June 25 open to close: trains share 1 track between El Segundo and Redondo Beach. On Friday evening shuttles will replace trains between Crenshaw and El Segundo. All westbound trains will turn back at Crenshaw and return to Norwalk. Trains from Redondo Beach will stop at El Segundo. From there, customers may board shuttles for continued eastbound service. 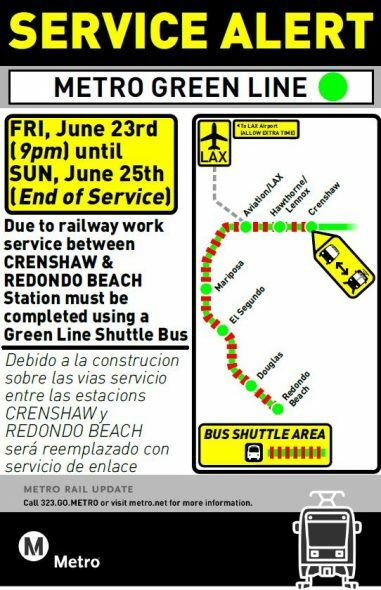 While Saturday’s work is in effect, bus shuttles will replace trains between Crenshaw and Redondo Beach. This means all westbound trains stop at Crenshaw and turn back towards Norwalk. Metro shuttles will be available at Crenshaw for continued westbound service. Green Line trains are slated to arrive every 15 minutes during the day and every 20 minutes at night throughout the weekend. Bus shuttles will match Green Line service levels as best as possible. However, customers should note that trains will not follow the regular posted timetables. For those planning to take transit to LAX while work occurs, please allow extra travel time to connect with bus shuttles. On Friday, June 23, the last complete eastbound trips depart Redondo Beach at approximately: 7:21 p.m., 7:40, 8, 8:20 and 8:40. The last complete westbound trips depart Norwalk at approximately: 7:07 p.m., 7:17, 7:30, 7:50 and 8:10. All times are subject to work related delays. Finally, we know the work can be an inconvenience and we’d like to thank everyone affected for their patience. Metro personnel will be on hand to assist customers at all stations between Crenshaw and Redondo Beach during the closure. To stay informed on the latest transit news and service updates, please check the Service Advisories page or follow us on Twitter @metrolosangeles or @metrolaalerts. Also Google building London Headquarters near Cross Rail. Make sure to send out extra rolling stock to the Crenshaw – Norwalk section as for you never now when a P2000 might break down.